J.K. Rowling's famous Harry Potter series first hit the big screen with Philosopher's Stone in 2001. I was eleven when I saw it in the cinemas, and immediately hooked. I had no idea where the film was made, and little did I care. As I got older, however, that sort of information became more interesting to me. When I found out that most of the filming was done at Warner Bros. Pinewood Studios in Leavesden, I was very happy indeed, because it is not far from London. I was even more excited when Warner Bros. opened up a Studio Tour in 2012, and was one of the first in line to book tickets. Since then, Warner Bros. Harry Potter Studio Tour has put on many exciting events, about the making of the films. None have been quite as exciting as what is on offer now. A chance to see all eight Harry Potter films at the site on which they were made. 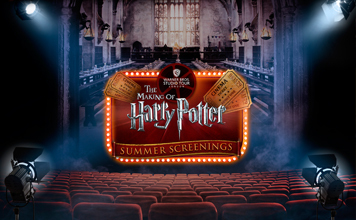 Between 7th July - 26th August, the films will have scheduled screenings in their cinema room. See authentic sets and props before snuggling into a comfy chair with a glass of foamy butterbeer, popcorn, and hot snacks. Tickets are £45 for adults or £37.50 for children. 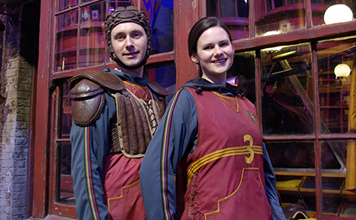 If you go between the 18th July - 1st September, you will also get a behind the scenes look at Bludgers and Broomsticks. Find out how the brooms were crafted, and personalised for each wizard, and learn about the technical aspects of shooting a quidditch match.